Nifty broke out of the slumber of the past couple of days, and crashed. I could not make the best of of it, but still managed some points. Nifty gapped up, and Spot went above 8700. Ignored the first pin bar, since it did not break the day's high. Placed short trigger below the green bar that broke the day's high. Had that order on for a long time, but cancelled it when a couple of small bars did not trigger it, thinking of the probability of 8750 being tested, and the trigger was just above the 8700 Nifty Spot Price. I would probably not have cancelled the order, if Nifty Future had touched 8750 before coming down. In hindsight, that was a bad move, and I missed the beginning of today's down move. I drew a support line and waited for a breakout pullback. Ignored the first time it happened. The second time, I was able to get in just before the crash. Just in time, because I had an errand to run immediately after that. Got the 20 points first target easily. The exit was a typo. I had intended to move the Stop Loss to 2 points above the close of the crash bar, but entered it as 2 point above the low of the bar. I do not regret achieving a better exit, and will probably do it again. All of today's trades were Breakout Pullbacks. I initially missed the Trade 2 entry because I was not watching. I entered when price came back up to my entry level - and this was against my rule on how to trade momentum. The second trade got me the 20 points. 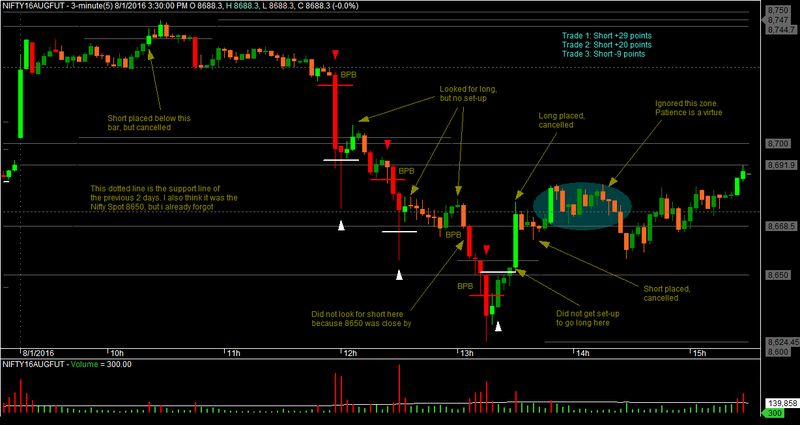 Ignored the Breakout Pullback that followed Trade 2 exit, because 8650 close by. The last trade went close to 20 points, but I made a loss. For that trade, I kept the Stop Loss above Round Number 8650. 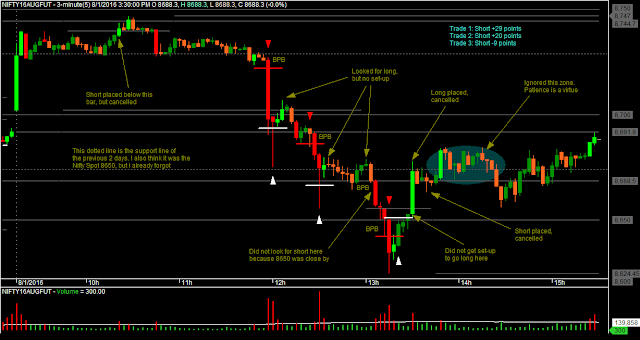 Round Number protected my Stop Loss on Friday, but the plan did not work today. This 20 point booking is totally against the motto that I had for the Range Compression Trading System, where I was supposed to trail slowly. A different trailing Stop Loss strategy would have given better results today. On the chart, I have marked the all the points where I anticipated a trade - that never materialized - or where I had cancelled the trigger by the time the trade materialized. 2. Not taking the Breakout Pullback after the Trade 2 exit. Patience is (hopefully) a virtue.